Find out why this colorful tubing is the up-and-coming plumbing trend that has DIYers excited. Cross-linked polyethylene (PEX), a type of flexible plastic, is currently replacing traditional copper and galvanized steel as water supply lines in both new construction and remodeling projects. 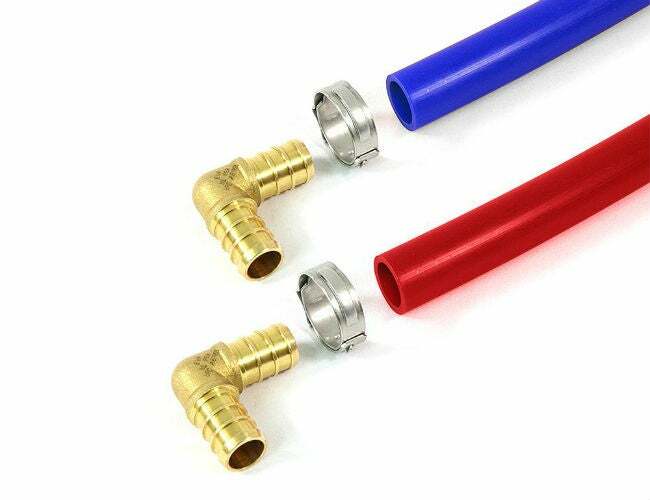 You’ve probably seen rolls of blue and red PEX pipe in the plumbing aisle of your local home improvement store, but might not know that this colorful tubing now makes it possible for enthusiastic DIYers to replace their own leaky water lines instead of calling a pro. 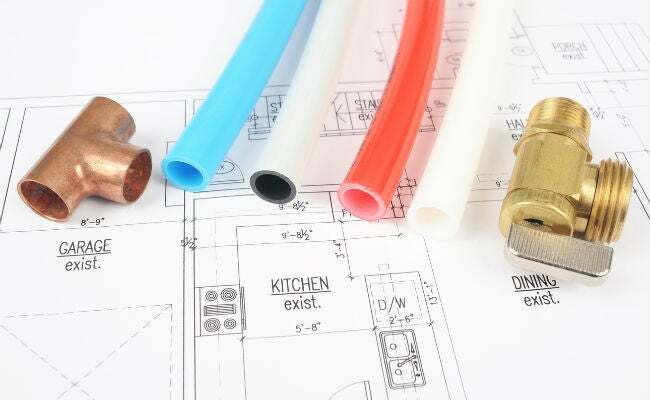 Read on to learn more about PEX—what it is, where it can be used, and all the pros and cons of this popular plumbing material. In 1968, German scientist Thomas Engle discovered a way to crosslink common plastic (polyethylene) through radiation to produce a much suppler form of the material. The new plastic, fashioned into flexible PEX pipe (also known as PEX tubing), arrived in the US in the 1980s, initially for radiant floor heating systems: The flexible tubing is embedded in a concrete slab and hot water pumped through to heat the slab and radiate heat to rest of the room. PEX pipe remains popular for radiant floor heating. While PEX use for water supply systems has been widespread in Europe since the 1980s, it was a latecomer here because some early versions deteriorated slightly when exposed to the high chlorine levels common in US water supplies. Adding antioxidants during manufacturing made PEX suitable for carrying drinking water and, over the past two decades, having met our potable drinking water standards, it started catching on. Complaints about early PEX water systems cropped up when the fittings used to connect the pipes failed and leaked. Improved fittings solved that problem and the popularity of PEX surged. Today, PEX is used in more than 60 percent of new construction residential water supply systems. PEX is available in a variety of lengths, from short 10-foot pieces (for small repairs) to rolls over 500 feet long, which are used to install a home’s entire water supply system. PEX pipe ranges from 3/8- to 1-inch in diameter and its color-coding makes it a snap to identify what a specific pipe is used for. Although there are three types of PEX (see Label Lingo, below), the different colors don’t connote the distinctions; they simply make it easy for the installer to identify which lines carry hot water and which carry cold. • Red PEX pipe carries hot water. • Blue PEX pipe carries cold water. • White PEX pipe can be used for either hot or cold water. • Gray PEX pipe, like white, can be used for either hot or cold water (although not all DIY centers carry gray). Traditional copper and galvanized steel water systems feature main lines and a series of smaller branch lines that lead to each fixture. Each branch that attaches to the main line requires a separate connection. 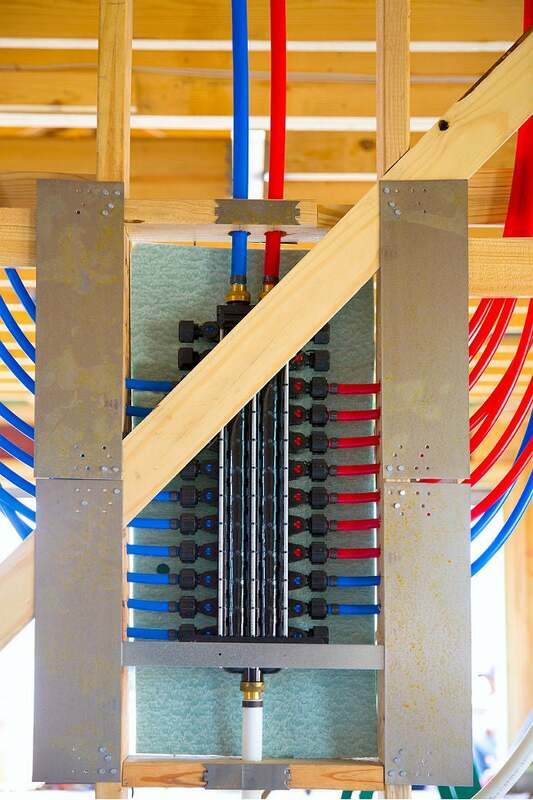 PEX has a distinct advantage over these materials because of its flexibility, which allows one end of PEX pipe to connect to a PEX manifold (the main water control system) and then wind through walls and floors—uninterrupted—all the way to an individual fixture. 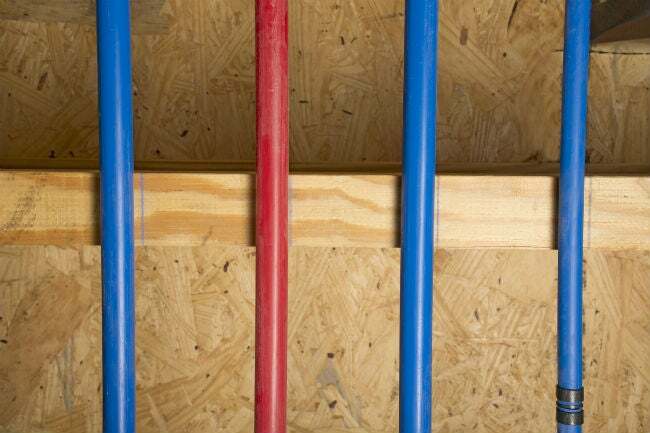 Called “homerun” plumbing, by using a single length of PEX for each hot and cold water supply fixture in your home, it eliminates the risk of leaks at multiple connection sites. Beyond flexibility, PEX has other advantages—and two main considerations. • Installing PEX does not require soldering as does copper and galvanized steel. • PEX expands, making it more resistant to freeze-cracking than either copper or steel. • PEX does not corrode, which can happen with both copper and steel pipes, leading to leaks and contamination of the water supply. • Water flows silently through PEX, eliminating the “water hammer” noise associated with metal piping. • Color-coding (red and blue) make it simple to distinguish hot and cold supply lines. 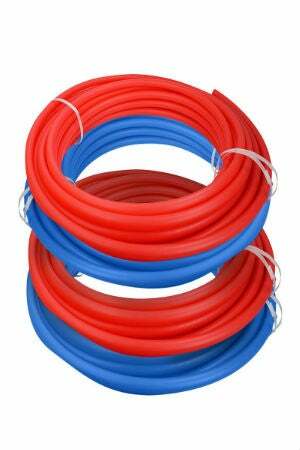 • PEX can be connected to existing metal supply lines with the correct fittings. • PEX is not suitable for outdoor use. Ultraviolet rays cause PEX to break down quickly—tubing left outdoors can harden and crack within a couple of months. • PEX cannot currently be recycled, because it does not melt as other recyclable plastics do. With the popularity of PEX rising, however, the demand for a way to recycle it will also likely rise. • Though installation is DIY-friendly, working with PEX requires special connectors and tools. • PEX-A is manufactured using peroxide. This type of PEX is the most flexible of the three types and is suitable for use in all home water-supply plumbing needs. It expands to the greatest degree when subjected to freezing water, so it’s the most resistant to cracking in frigid temperatures. It’s easy to work with but it’s more expensive than B or C. A 10-foot piece of PEX-A runs $3.50 to $7.50, depending on brand and diameter. Other than flexibility, PEX-A has no significant benefit over PEX-B. • PEX-B is manufactured using a moisture-cure method. PEX-B is slightly stiffer than PEX-A, and has a distinct coil “memory” that makes the tubing want to return to its original coiled state. The coil memory, however, is not a hurdle to installation, and PEX-B is often the tubing of choice for residential plumbing because it also expands to resist cracking when water freezes but is less expensive than PEX-A: A 10-foot section of PEX-B runs $2.50 to $5.50, depending on brand and diameter. PEX-B also features an increased resistance to chlorine, making it a good choice in areas where water is highly chlorinated. • PEX-C is manufactured via an irradiation method. Because it’s the stiffest version, PEX-C is the most difficult to work with; this stiffness also makes it most prone to kinking, as well as susceptible to cracking when water freezes. These undesirable traits make PEX-C best suited for short repairs where bending around sharp corners isn’t necessary. PEX-C is the most economical choice, with a 10-foot section running $1.75 to $3.50, depending on brand and diameter. To make watertight connections with PEX pipe, you’ll need the right tools and supplies. For each of the following methods of connecting, the fittings and connectors must be an exact match to the size of the PEX pipe. Hundreds of types of fittings, usually brass, are available for connecting PEX to existing copper or steel pipes, and for making connections to fixtures. Fittings are also available for connecting pipes of different sizes. The following five methods are used for making the connections watertight. • Copper crimping: One of the most common ways of connecting PEX is with copper crimping rings, which requires the use of a special PEX crimping tool. The copper ring slips over the end of the PEX tube, and a fitting is then inserted into the PEX tube. The copper ring is then pushed to the end of the tube—over the fitting—and a PEX crimping tool is used to crimp the copper ring (and tube) tightly in place. • Expansion connections: The expansion method of connecting PEX involves using a special PEX expander tool to stretch the diameter of the PEX tube before inserting the end of a fitting. The PEX tube then shrinks back to its original size to create a water-tight seal around the fitting. • Stainless steel clamps (SSC): The SSC method of connecting PEX involves using a ratchet clamping tool to tighten stainless steel rings around PEX connections. Similar to the copper crimping method, the steel ring is slipped over the PEX tube before the fitting is inserted. The ratchet clamping tool is then used to squeeze a tab on the ring, which tightens the ring securely around the tube and the fitting. • Compression fittings: This type of fitting involves slipping a threaded brass nut over the end of the PEX tube, followed by a tapered plastic compression ring. A hollow brass tube is then inserted into the end of the PEX tube. The whole thing is then inserted into the end of a threaded fitting and the threaded brass nut is then screwed onto the end of the fitting. As the nut is tightened, it squeezes the plastic compression ring against the end of the brass fitting to create a seal. • Push-fit connections: The quickest way to connect PEX is with the push-fit method, which involves purchasing special push-fit fittings that “grab” the end of the PEX pipe when inserted over the end. No special tools are required to use push-fit fittings, but a special removal ring is required to remove them from the end of the pipe once you’ve connected it. As a child, if you ever played with one of those paper tube “traps” that grabbed your finger when inserted into the tube, you get the idea of how push-fit connecting works. • For the best results, use only the recommended tools for making PEX connections. For example, you won’t get as tight a fit if you try to use pliers to crimp a connecting ring as you will by using a PEX crimping tool. • Store PEX indoors and away from a sunny window since the pipe degrades in UV light. 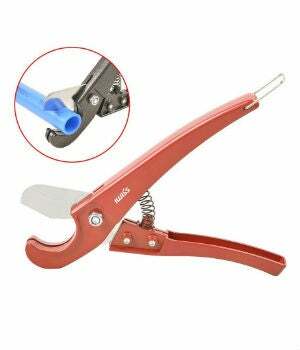 • Use a PEX cutter to make clean end cuts that will be easier to work with.